The Fiat logo is seen on a car on display in a car reseller in Milan, Italy, Wednesday, Jan. 27, 2016. Fiat Chrysler Automobiles NV (FCAU.N) said it would pay a 2 billion-euro (US$2.27 billion) extraordinary dividend to shareholders after the sale of its auto parts unit, and plans to begin paying a regular dividend starting next year. It’s the first dividend since the Italian-American company was formed in 2014, a move that fulfills a pledge made by late Chief Executive Officer Sergio Marchionne. The pending sale of its Magneti Marelli auto-parts unit this month for 6.2 billion euros paves the way for the payouts. While the automaker posted record margins in North America and resurgent profit in Latin America, the results highlight Fiat Chrysler’s increasing dependency on truck and SUV sales in the U.S. Businesses in Europe and Asia turned to losses. 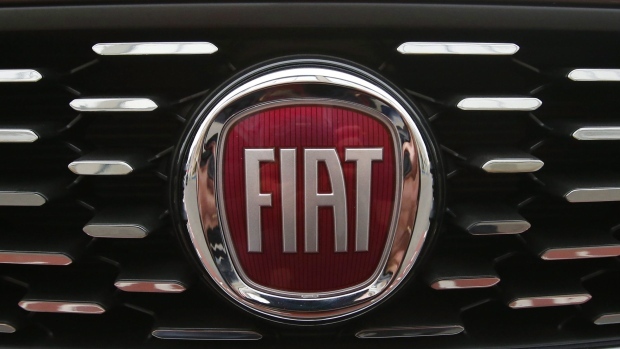 Fiat took advantage the robust performance in the Americas and a pending windfall from the sale of Magneti Marelli to tie up costly loose ends -- it disclosed a 700 million euro charge from diesel litigation in the U.S. and accelerated payments to its pension fund. The adjusted Ebit margin of 10.2 per cent of sales in the NAFTA region exceeded the record 8.4 per cent reached in the second quarter of 2017. The gains are an outgrowth of Fiat Chrysler’s January 2016 decision to ditch production of conventional cars in the U.S. and focus on more profitable trucks and SUVs. Fiat Chrysler’s problems in China continued: The Jeep brand is struggling, and dealers have been forced to lower prices amid stiffer competition. Slumping Maserati sales carried through to the third quarter. Shares of Fiat Chrysler fluctuated, advancing as much as 2.3 per cent in Milan before falling back, and were trading down 1.5 per cent at 2:19 p.m. The stock has declined 6.3 per cent this year -- but in an industry buffeted by trade wars, diesel headaches and a China slowdown, that’s still good enough for third-best year-to-date on the Stoxx 600 automobiles and parts sub-index.